Surrender or die – this is the offer that President of the Chechen Republic Ramzan Kadyrov has made to suspected terrorists hiding out in the region's forests. Local special forces are maintaining their meter-by-meter search & destroy operation on the border between Chechnya and Ingushetia. The source at the Republic’s Interior Ministry told RT that thousands of policemen are searching the forest around the clock. Interior Ministry units from all over the North Caucasus are also taking part in the special mission. Police say they resumed the active stage of the special mission earlier this morning after they had to suspend it yesterday in the evening. The police said it was too dangerous to chase the suspected militants in the forest in darkness. They add that they have surrounded a group made up of approximately 30 suspected militants, with foreign mercenaries reportedly among them. The group is believed to be led by the top Chechen militant Doku Umarov. The 45-year-old is believed to be one of the most dangerous Russian terrorists and is on the country's most wanted list for alleged murders, kidnappings and terror attacks. He is also believed to be behind the Beslan school siege in 2004, which ended in a bloodbath claiming the lives of nearly 300 people – most of them children. Not far from the operation site is the village of Bamut, where the latest clash between police officers and a group of six suspected gunmen took place. 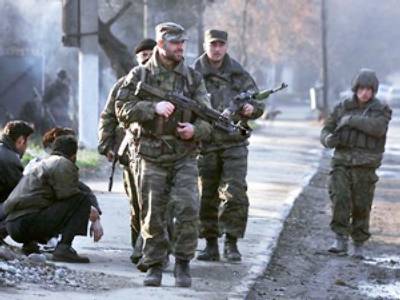 It is reported that one militant got killed in the fighting and one policeman was injured.